Ray umpired baseball games from 1968 to 1998 on a variety of levels, including Little League, American Legion, high school, junior college, the Western Athletic Conference and the Pac-10. He served as president of the Arizona Interscholastic Association Umpire Association in 1978. Ray also coached youth hockey from 1970 to 1973 and earned a hockey scholarship to Crestwood University in the Province of Ontario. His contributions to youth sports in Tucson are numerous within the Arizona Softball Association, Special Olympics, Arizona Golf Association, Boys & Girls Clubs, the Tucson Conquistadores, FW Little League, Sunnyside Little League, Aztec Wrestling Club, Pima Community College Football, Ironwood Ridge High School Football, Tucson Chargers Football League, Tucson Swim, MJ Stoops Inc., Arizona Icecats, Kidz Gear for baseball and various high school football, baseball and wrestling programs throughout Tucson. Outside of sports, Ray is involved with many civic organizations. 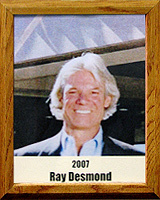 Ray received his master’s degree from the University of Arizona in 1977. He attended the University of Detroit High School and played track and field, and baseball. Ray founded Nova Home Loans in Tucson in 1980 and is a mortgage banker.